A friend of mine shared how she made teriyaki chicken in the slow cooker and it sounded easy enough…cut up boneless skinless chicken breasts or thighs in the slow cooker and pour a bottle of teriyaki sauce over it and cook it for a couple of hours. I tried it her way and to be honest it was just “okay” and sort of bland. So I decided to play with the recipe a little bit and came up with something that tastes better. 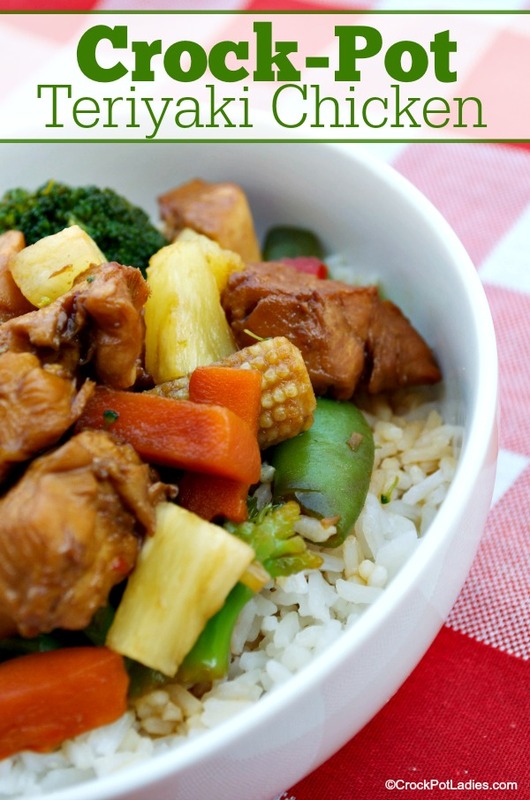 I am not going to pull your leg on this one though…cooking a teriyaki chicken stir fry is much easier and quicker on the stove-top in a skillet and you’re not going to get any better flavor cooking it in the slow cooker. I may just be shooting myself in the foot with this recipe because this is after all a slow cooker recipe blog. But I think honesty is the best policy. 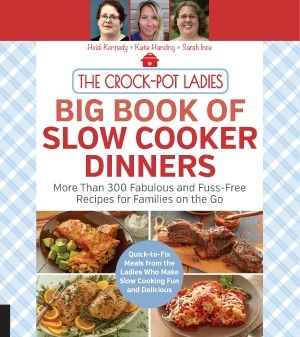 And my honest opinion is that some recipes are better NOT cooked in the slow cooker. That being said…if you are a die hard slow cooker user or maybe you don’t have a stove-top to cook on (I know we have several readers who don’t…they are traveling in RV’s or trucks, they are remodeling their kitchens or their stove just went up and broke on them) and you have a hankering for some teriyaki chicken then go ahead and give this recipe a try. 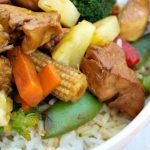 Boneless skinless chicken breasts (you could use thighs too if you want) are simmered in the slow cooker with a yummy Asian teriyaki sauce and pineapple juice. Steamed Asian vegetables are added near the end and then you can opt to serve this dish over white or brown rice or noodles. Add chicken cut up chicken pieces to a 5 quart or larger slow cooker. Open can of pineapple tidbits and pour just the liquid into the slow cooker, reserving pineapple for later. Add teriyaki sauce, ginger, brown sugar, and garlic to slow cooker and stir to combine and coat the chicken. Cover and cook 2 to 3 hours on low till chicken is done, stirring half way through cooking time to break up chicken. About 30 minutes before chicken is to be done cooking, start to cook your rice or noodles on the stove-top (or in a rice cooker for the rice). Cook the vegetables in the microwave according to package directions. Open bags of vegetables and toss in slow cooker and mix into chicken and sauce. Add the reserved pineapple tidbits. Spoon rice or noodles on plates and top with chicken and vegetables to serve. We served this over steamed jasmine rice, however any white or brown rice or even noodles would be good too. 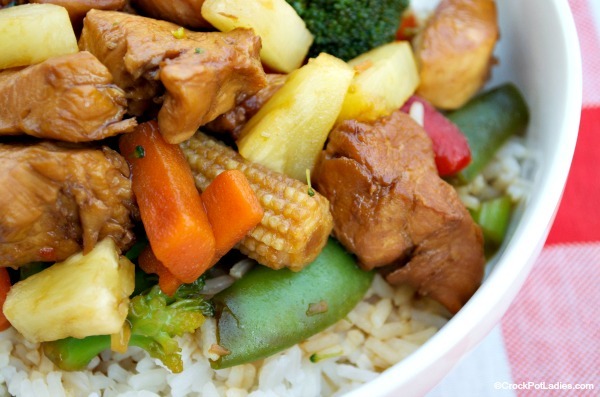 To make this recipe gluten-free be sure to use a gluten-free teriyaki sauce such as those made by San-J. Linked up at Eat at Home. Robin, did you have a recipe to submit? Nothing came thru on your comment. I looked under gluten-free recepies and these are not gluten-free. Teriaki sauce is not g/f. There is a wine recepie too under g/f. alot of wines aren’t g/f. I haven’t looked at the rest, just thought you would want to know that these recepies are coming up under the wronge catagory. It’s fun to do Asian inspired foods in the crockpot sometimes. Quick and easy prep is always good! I absolutely love that I can adjust the recipe’s to one person! Thank You ever so much. It helps alot. We are glad you like our recipes and can adjust it to fit your needs. Hello. I am having a problem finding the Kikkoman Teriyaki Baste and Glaze with Pineapple/Honey. I did find the plain Kikkoman Teriyaki Baste and Glaze. Will that work for this recipe? Should I add any other ingredients to makeup for the change? Hi Monica, I have been having a harder time finding it locally here too in recent months. I am wondering if maybe they have discontinued it? Either way, the regular Teriyaki Baste and Glaze will work just fine. You should not need to add any other ingredients. The flavor is pretty similar with the Pineapple one having just a touch of pineapple flavor. If you really want to add that you can add in some pineapple juice (maybe 1/4 cup) but I wouldn’t go out of my way to buy pineapple juice just for this recipe.